spacecraft. It was developed after the huge expense of the Apollo missions. Those craft were used only once. 1 he space shuttle can be reused over and over. It consists ol three parts: 1) the orbiter, an airplane-like both’ with three engines, 2) an external tank to fuel the engines at liftoff, and 3) two solid rocket boosters for extra energy at liftoff. The shuttle is launched like a rocket, orbits the Earth like a spacecraft, and lands like a glider. 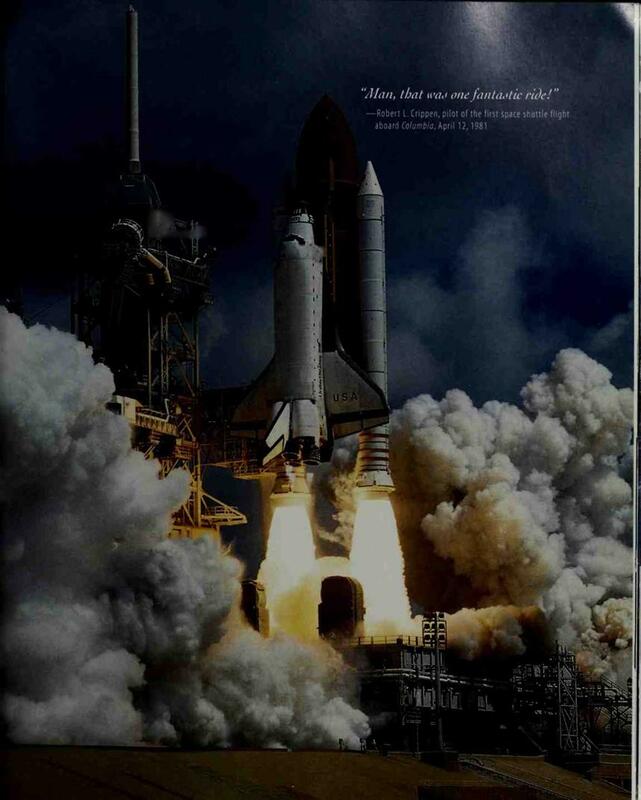 The first shuttle to fly in space was Columbia. It lifted olf on April 12, 1981, with astronauts John Young and Robert Crippen. “T-iMinus 5…4…3…2… 1 Ignition!” Columbia’s engines roared to life and it blasted into the sky. twelve minutes later it was circling the Earth 200 miles high. The flight lasted 54 hours and made 36 Earth orbits. All systems performed well. The astronauts were thrilled wit h the two-day ride. Alter returning safely to Earth, John Young said, "We are really not that fax’…from going to the stars." In case of emergency before launch, the crew exit the shuttle in a slidewire basket. Shuttle Endeavour mission specialists practice the exit. As Michael Foale pulls a lever to release the basket, Claude Nicollier and John Grunsfeld watch. N amazingly complex machine, the space shuttle has over 600,000 different parts. Among its most important features is its tile heat shield. ft atmosphere, it zooms at 25 times the speed of Ш sound. Air molecules cannot move out of the wav of the craft fast enough. They pile up and squeeze together. This generates heat of over 5,000 degrees Fahrenheit. Thousands ot silica tiles on the shuttle absorb and throw oil scorching heat. The shuttle’s launch system has three components. The orbiter’s engines ignite only at liftoff. A huge orange fuel tank feeds them 800 tons of liquid fuel. Two white solid rocket boosters burn solid fuel at lift-off, then fall oil. They parachute into the ocean to be recovered and reused. The orange tank tails olt and burns up in the atmosphere. 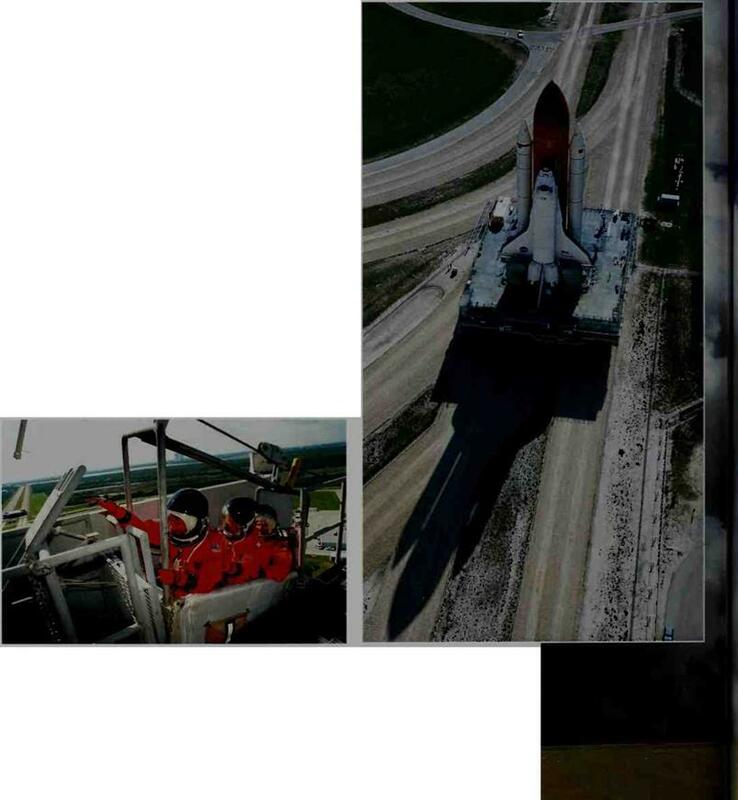 The shuttle’s engines and boosters deliver an incredible 7 million pounds of thrust to launch the shuttle into orbit. Scorch marks and holes on the shuttle Endeavour’s tile covering show the effects of reentering the atmosphere. 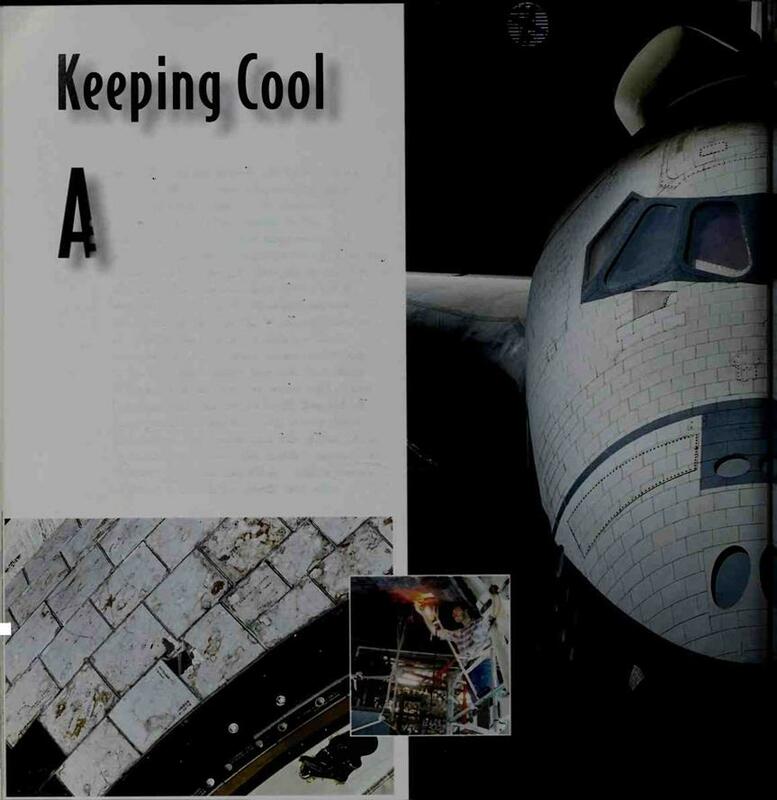 The heat shield of ceramic silica tiles protects the shuttle by insulating it from the heat. The shield must be repaired after each flight. 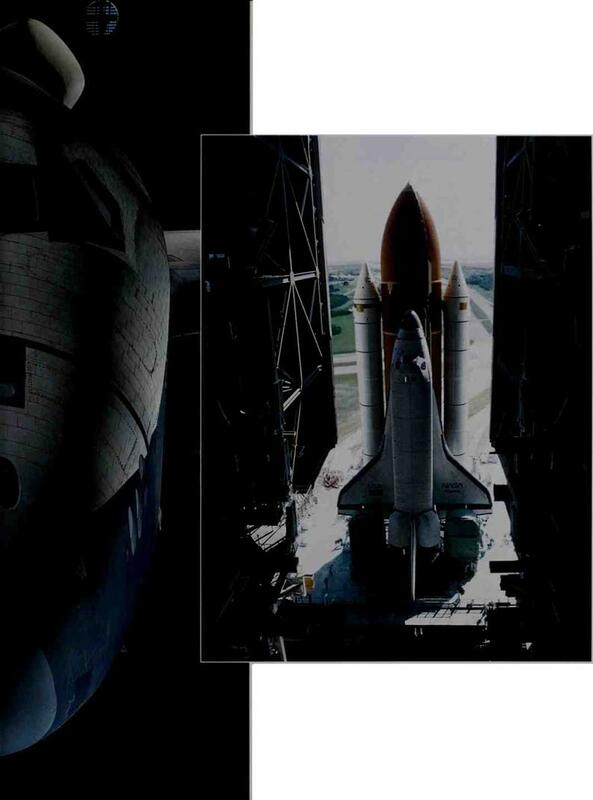 34,0 ceramic tiles that make up the ther­mal shield on the shuttle’s top and belly. The tiles are one-half to З А inches thick. Above, a technician replaces damaged tiles on the Columbia, gluing each one by hand. The shuttle orbiter’s three engines consume 800 tons of fuel in about 10 minutes. They alone generate enough power to light up New York state! The shuttle Atlantis stands assembled for launch outside the Vehicle Assembly Building, or VAB, at Kennedy Space Center. The white shuttle orbiter uses its own engines plus two booster rockets and a disposable fuel tank to propel it into space.